WELCOME TO THE RAW FOOD KITCHEN WEBSITE TERMS AND CONDITIONS FOR USE. THESE TERMS AND CONDITIONS APPLY TO THE USE OF THIS WEBSITE AT www.therawfoodkitchen.com BY ACCESSING THIS WEBSITE AND/OR PLACING AN ORDER, YOU AGREE TO BE BOUND BY THESE TERMS AND CONDITIONS. USING THIS WEBSITE INDICATES THAT YOU ACCEPT THESE TERMS REGARDLESS OF WHETHER OR NOT YOU CHOOSE TO REGISTER WITH US OR ORDER FROM US. IF YOU DO NOT ACCEPT THESE TERMS, DO NOT USE THIS WEBSITE. 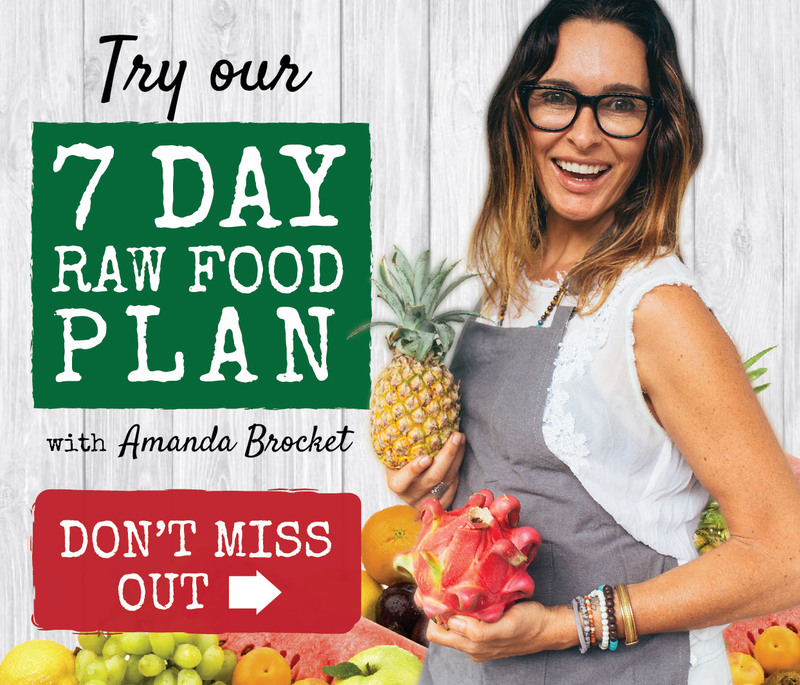 The www.therawfoodkitchen.com website is operated by: Amanda Brocket trading as The Raw Food Kitchen Pty Ltd and we are a GST registered company. All prices advertised on the website include GST unless otherwise stated and the GST price will be displayed at point of purchase. All residents and citizens of Australia are required to pay GST on purchase. International Association of Raw Food Coaches and Teachers. Trading address: 101/385 Sydney Road, Balgowlah, Sydney, NSW 2093, Australia. ABN: 61 166 973 904. Telephone number: 0412 146 444. 3.1 Our prices at purchase point include GST. 3.3 Our prices are reviewed periodically and the next review will be on 30/08/2019. 3.4 All transactions are processed in AUD. 3.5 We offer payment plans where appropriate and require a 20% deposit to secure booking. We offer flexibility around payments to suit customer preference on periodic payment plan. Last payment must be made one month prior to event / retreat date. 4.2 You can return goods you have ordered from us for any reason at any time within 14 days of receipt for a full refund or exchange if the package and or goods are unopened and undamaged. This does not apply to eBooks or online programs. The costs of returning goods to us shall be borne by you. 4.3 Upon receipt of the goods we will give you a full refund of the amount paid for the product itself or an exchange credit as required. 4.4 The rights to return the goods to us as referred to in clause 4.3 will not apply in the following circumstances: in the event that the product has been used, in the case of software, audio, virtual or visual products, where the packaging has been unsealed. The provisions of this clause do not affect your statutory rights. 4.5 No refunds are given for the purchases of online education products or services. 5.1 Should you be unable to attend any of our workshops you booked and confirmed, a substitute is always welcome at no extra charge. A full refund, less an administration charge of 10%, is given for cancellations received in writing four weeks – two weeks prior to the event. Cancellations one week prior to event is non refundable. The ticket may also be transferable to another workshop of the same value. 5.2 If you cancel a retreat 90 days or more from retreat date a refund less 50% administration charge will be given. If you cancel within the 90 day period before retreat date no refund will be given. A substitute is always welcome at no extra charge. 5.4 In the event that The Raw Food Kitchen reschedules, cancels an event, course, retreat or workshop, payments received at the cancellation date will be refunded or credited at The Raw Food Kitchen’s discretion less an admin fee of up to 50%, and or may be used towards attendance at a future class/training/workshop/event/program. Or in the event of postponement by The Raw Food Kitchen, a rescheduled date. The Raw Food Kitchen reserves the right to postpone, reschedule or cancel an event, program, course, workshop, retreat or class, to change the location or to alter the advertised speakers or itinerary. The Raw Food Kitchen is not responsible or liable for re-imbursement of any airfares, travel expenses, accommodation or other external costs incurred related to booking an event with The Raw Food Kitchen that may be cancelled or postponed. 5.5 The Raw Food Kitchen is not responsible for any loss or damage as a result of substitution, alteration, postponement, or cancellation of an event due to causes beyond its control including without limitation, acts of God, natural disasters, sabotage, accident, trade or industrial disputes, terrorism, or hostilities. We reserve the right to charge administration fees for retreat, events or workshop bookings due to any extra handling the booking may require, cancel events or classes due to insufficient numbers. 5.6 You will be required to pay GST if you are residing within Australia. 6.2 Unless otherwise stated, the copyright and other intellectual property rights in all material on this Website (including without limitation photographs and graphical images) are owned by us or our licensors. For the purposes of these terms and conditions, any use of extracts from this Website other than in accordance with clause 5.1 above for any purpose is prohibited. If you breach any of the terms in these terms and conditions, your permission to use this Website automatically terminates and you must immediately destroy any downloaded or printed extracts from this Website. 6.3 Subject to clause 5.1, no part of this Website may be reproduced or stored in any other website or included in any public or private electronic retrieval system or service without our prior written permission. 6.4 Any rights not expressly granted in these terms are reserved. 7.1 While we endeavour to ensure that this Website is normally available 24 hours a day, we will not be liable if for any reason this Website is unavailable at any time or for any period. 7.2 Access to this Website may be suspended temporarily and without notice in the case of system failure, maintenance or repair or for reasons beyond our control. 8.3 You may not misuse the Website (including, without limitation, by hacking). 8.4 We will fully co-operate with any law enforcement authorities or court order requesting or directing us to disclose the identity or locate anyone posting any material in breach of clauses 7.2 or 7.3. 9.1 Links to third party websites on this Website are provided solely for your convenience. If you use these links, you leave this Website. We have not reviewed all of these third party websites and do not control and are not responsible for these websites or their content or availability. We therefore do not endorse or make any representations about them, or any material found there, or any results that may be obtained from using them. If you decide to access any of the third party websites linked to this Website, you do so entirely at your own risk. 9.3 for breach of these terms and to take any action we deem appropriate. 9.4 You shall fully indemnify us for any loss or damage we or any of our group companies may suffer or incur as a result of your breach of clause 8.2. 10.1 To register with www.therawfoodkitchen.com you must be over eighteen years of age. 10.2 Each registration is for a single user only. We do not permit you to share your user name and password with any other person nor with multiple users on a network. 10.3 Responsibility for the security of any passwords issued rests with you and if you know or suspect that someone else knows your password, you should contact us immediately. 10.4 We may suspend or cancel your registration immediately at our reasonable discretion or if you breach any of your obligations under these terms and conditions. 11.1 While we endeavour to ensure that the information on this Website is correct, we do not warrant the accuracy and completeness of the material on this Website. We may make changes to the material on this Website, or to the products and prices described in it, at any time without notice. The material on this Website may be out of date, and we make no commitment to update such material. 11.2 The material on this Website is provided “as is” without any conditions, warranties or other terms of any kind. Accordingly, to the maximum extent permitted by law, we provide you with this Website on the basis that we exclude all representations, warranties, conditions and other terms (including, without limitation, the conditions implied by law of satisfactory quality, fitness for purpose and the use of reasonable care and skill) which but for these terms and conditions might have effect in relation to this Website. 12.1 We, any other party (whether or not involved in creating, producing, maintaining or delivering this Website), and any of our group companies and the officers, directors, employees, shareholders or agents of any of them, exclude all liability and responsibility for any amount or kind of loss or damage that may result to you or a third party (including without limitation, any direct, indirect, punitive or consequential loss or damages, or any loss of income, profits, goodwill, data, contracts, use of money, or loss or damages arising from or connected in any way to business interruption, and whether in tort (including without limitation negligence), contract or otherwise) in connection with this Website in any way or in connection with the use, inability to use or the results of use of this Website and its contents, any websites linked to this Website or the material on such websites, including but not limited to loss or damage due to viruses that may infect your computer equipment, software, data or other property on account of your access to, use of, or browsing this Website or your downloading of any material from this Website or any websites linked to this Website. (iv) any liability which cannot be excluded or limited under applicable law. 13.1 These terms and conditions shall be governed by and construed in accordance with Australian law. Disputes arising in connection with these terms and conditions shall be subject to the exclusive jurisdiction of the Australian courts. 13.2 We do not warrant that materials/items for sale on the Website are appropriate or available for use outside of Australia. It is prohibited to access the Website from territories where its contents are illegal or unlawful. If you access this Website from locations outside of Australia, you do so at your own risk and you are responsible for compliance with local laws. 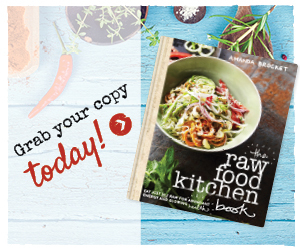 15.1 The Raw Food Kitchen is committed to providing exceptional customer service and quality products. We endeavour to make sure that all products listed on our website are currently in stock, pricing is true and correct and if content is electronic, available for immediate download. If you have any issues with downloading your electronic material please contact us immediately and we will endeavour to resolve the problem as soon as possible.